Unique high intensity corridor mixed-use residential/commercial zoned property with about 60% lake and over 1,770 frontage on chiquita blvd. With current zoning of 20 dwelling units/acre the property can theoretically accommodate up to 1,172 units and with the upcoming zone change of 25 units/acre, 1,465 units. Since the existing lake can accommodate the water retainage requirement of the site, the 21. 66 acres upland is net usable land. This is a project for more serious developer with endless mixed-use possibilities to utilize the 37-acre lake as an amenity. Presenting the crown jewel of cape coral with its breathtaking opulence and glistening river views. Boasting 11,099 sq ft of living space thoughtfully architected to create a staggering degree of space, light, and privacy. From solid onyx slabs and columns imported from the orient to the hand crafted cloister vaultings and ornate multi-level crown moldings no expense was spared when bringing this vision into a reality. Double spiral staircases wind up to a medallion embellished landing and custom south american mahogany double doors. Enter to cathedral height ceilings and a grand foyer anchored by an exotic marble and cherry wood fireplace as well as an extravagant lapis lazuli chandelier. No two bedrooms or bathrooms are alike with trompe-lil detailing and exquisite custom made millwork. Embark on a journey of the senses with moorish arches framing picture perfect scenery and spiral staircases rising to imperial suites and adorned alcoves. Embrace the golden sunrises and sparkling night views. Enjoy brisk early morning walks and bike rides to the nearby beach and pier. Experience a life of luxury in an heirloom that will be passed down from generation to generation. This corner of burnt store road and pine island road is just moments away from being purchased and developed and you can have a part in this incredible investment. 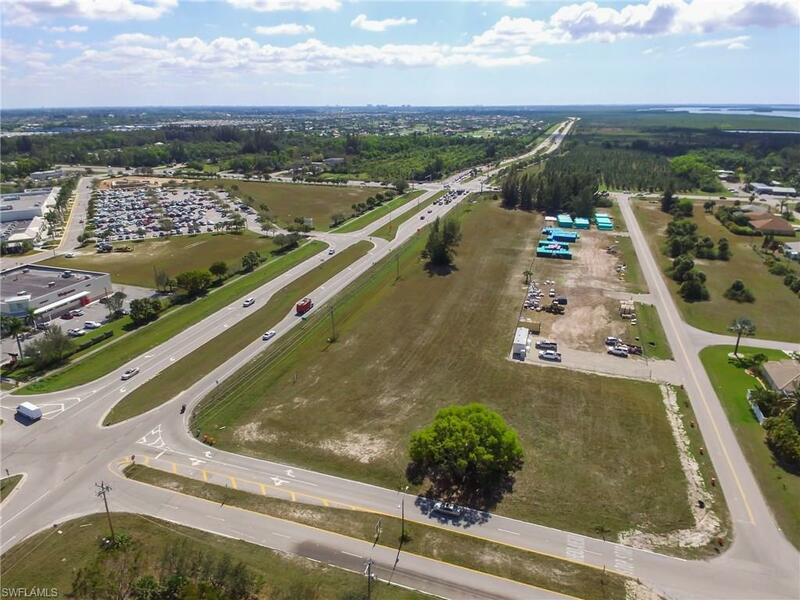 It's no secret that this location of cape coral is desirable and growing fast! Commercial corner of ceitus and burnt store road which totals approximately 236,600 square feet with corridor land use which allows for a variety of commercial uses i. E. Fast food, convenience store with pumps, financial institutions, retail,medical and more. As per city of cape coral utilities including water-sewer-irrigation will be available for hook up the later part of 2018/ directly across from publix shopping center, walgreens, mcdonalds. And soon to be 7-11 and achevia credit union. Proposed site plan available showing 40-50,000 sq. Ft of rentable space. Call today for more information! Multiple pids18-44-23-c3-05337. 0070,18-44-23-c3-05337. 0090. 18-44-23-c3-05337. 0110,18-44-23-c3-05337. 0130,18-44-23-c3-05337. 0150. 18-44-23-c3-05337. 0180,18-44-23-c3-. 05337. 0240,18-44-23-c3-05337. 0280,and0320. 0340,. 0380,. 0420,and0460 buyer to assume any or all assessments. Assessment approximate payoff balance of $400,000. 00. Spectacular custom estate in prestigious yachting community of cape harbour. Situated on 300' of waterfront, can fit multiple yachts- 36,000 & 15,000 lb lifts. Soaring ceilings with open floor plan; the main residence boasts gourmet kitchen; three story 3-tiered chandelier over the formal dining room and master bath with 6 person spa are just a few features that make this home spectacular. Decorated by a world renowned interior designer; offered completely furnished and includes all art, furniture and electronics. Hardwood and marble flooring w/mosaic wall and ceiling accents gives amazing texture and feel to this estate. The adjoining 2 story guest home or care taker/ mother law house. Walk out onto your private 4th floor veranda for unending water views of the barrier islands and the gulf of mexico. 2 garages. Currently 5 car spaces but possible 8. One garage is 42 and can accommodate rv/ boat or 2 car-lifts that each hold 3 cars for total 6 cars in one garage. Constructed to commercial standards including concrete floors, steel beams, impact resistant windows and fire suppression system. Southern exposure meets resort style living, in this custom built riverfront home. An entertainers delight! Enjoy the wrap around views overlooking the resort style pool and spa. A few steps away is your dock with two 20,000 pound boat lifts, tiki huts and jet ski lift. All at the mouth of the caloosahatchee river, and minutes to the gulf. Relax in the privately gated home, free of all hoa fees and live in this highly desired neighborhood, lined with beautiful royal palms. This home has the finest upgrades and features inspired by the owner. Walk in the grand entry and be mesmerized with the custom millwork, columns, ceilings and views galore! Come up into a spectacular two story library, where you can relax, listen to music or read a book by the marble fireplace. And it doesn't end there! The endless features of this home include: an elevator, storm shutter, sonos music system inside and outside, exercise room with sauna, billiard room with custom bar and wine cellar, four car garage with a separate motorcycle garage, along with two full size generators! 10 acre commercial parcel. Wal-mart owns property across the road. This parcel is immediately next to the proposed mall location just west of the german american club. 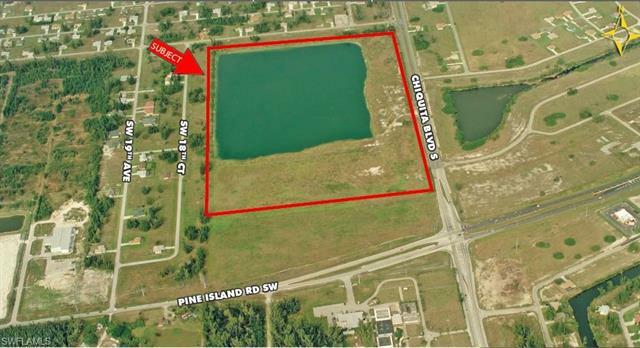 Property has 330 ft of pine island road frontage. Outstanding location for franchise restaurant or retail outlet. A truly unique and exceptional property! Enjoy morning sunrises over the river, suntan all day long with the sunny south facing pool and end your day with beautiful sunsets. 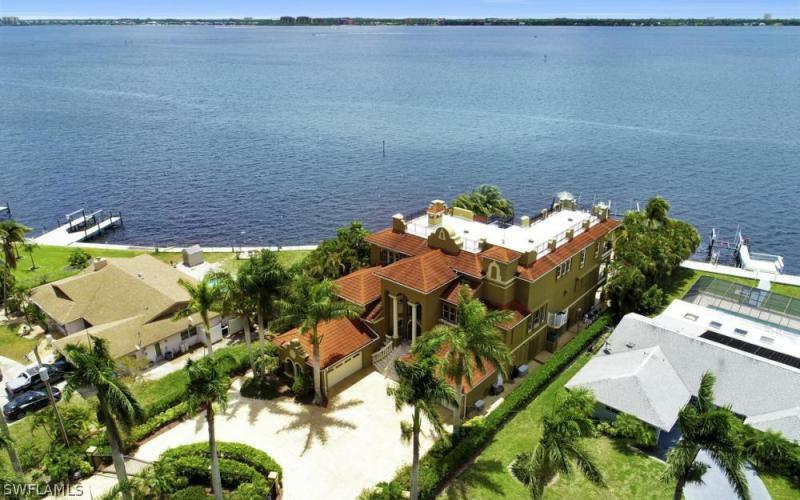 You can have it all with this elegant 6-bedroom, 6-bath, 3 car garage home with 225' of waterfront, it's like living on your own private island watching the dolphins play and the yachts troll by. This amazing home has just been completely renovated to the highest standard with amenities and decorator touches that you will find in no other. Two bedrooms are private suites completely with their own kitchens. The owner's suite features an elegant bath with hand painted walls, hardwood floors, dual closets and a private balcony. Off the pool is a suite that makes for an ideal detached guest house or pool cabana. Down the sweeping staircase is where the party is at with an incredible game room and full bar. Outside for the water toys is 4-lifts (20k, 10k,7k & dual wave runner lift). The extensive docks include a tiki hut and kayak launch. Additionally, is a whole house generator, impact glass windows and impact glass railings. Seller has done an $800,000 renovation over the last 18 months. Seller says bring an offer!!!! !exclusive casablanca private villa located in the most sought after gated community in cape coral the hermitage. Rare southern exposure, intersecting wide canals offering mangrove and river views, this exclusive villa offers custom travertine tile inside and out, beautiful wood cabinetry and granite situated perfectly in a kitchen that looks onto the infinity edge pool, four bedrooms, den, exercise/hobby room as well as a game room. If location is everything you found it!!!!! 100' of seawall with wrap around dock that includes a 16k lb boat lift, one minute to the river. Walk to cape harbour and enjoy the restaurants, boutiques and endless entertainment, the hermitage is an exclusive gated community in the most sought after location in all of cape coral.